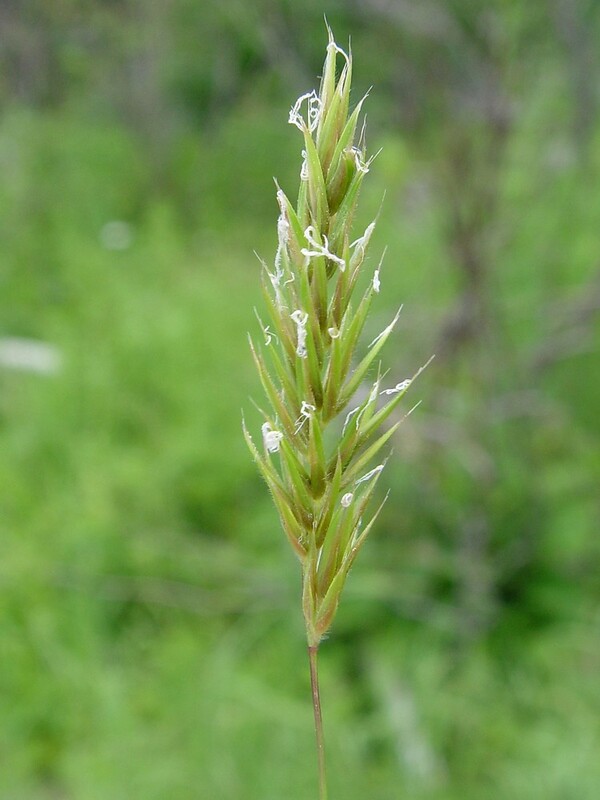 Anthoxanthum odoratum is a perennial C3 grass (Waller and Lewis 1979), short-lived, 30-70 cm, stems tufted, unbranched, root mat shallow, dense, ligule to 0.3 cm long. Leaves alternate, 1–12 cm long; 0.1-0.5 cm wide (Clayton et al 2002+), mostly basal, upper surface rough, upper leaves shorter than lower, sweet odor when bruised. Anthoxanthum odoratum.Donald Cameron.New England Wold Flower Society.gobotany.newenglandwild.org (Both Accessed 5/2014). Flower spikelets flattened, 0.8-1 cm long, outer scales (glumes) very unequal, the outer glume 0.4 cm long, the inner 0.7-0.9 cm long, both perisisting after fruit falls, inner scales (sterile lemmas) 0.3 cm long, both awned, very hairy, 2-lobed, both falling with fruit; a smaller pair of scales (short lemma and membranous palea) surround the single fertile flower, stigmas white, hairy, 2-parted, stamens 2, purple, appearing after stigmas (Farmer 2007); self-incompatible (Grant and Antonovics 1978); inflorescence dense and spike-like with many short branches, 3-9 cm long; 0.6–1.5 cm wide, pale green becoming yellowish, or brownish green, compact, (Clayton et al 2002+);). blooming May-June. Fruit a 1-seeded grain, 0.1-0.2 cm long; grain falling with enclosing awned lemmas, move a few millimeters a day over soil by the winding and unwinding of its awns with changes in humidity (Pitcher 1995). Habitat: Open disturbed areas, meadows, roadsides, open woods, fill. Notes: Highly competitive against many other common weeds, especially early in growing season. Tolerates acid soil down to pH 3.9 (Greller et al. 1990). Found in woodland humus soil pH 5.0 (Gargiullo unpublished data). 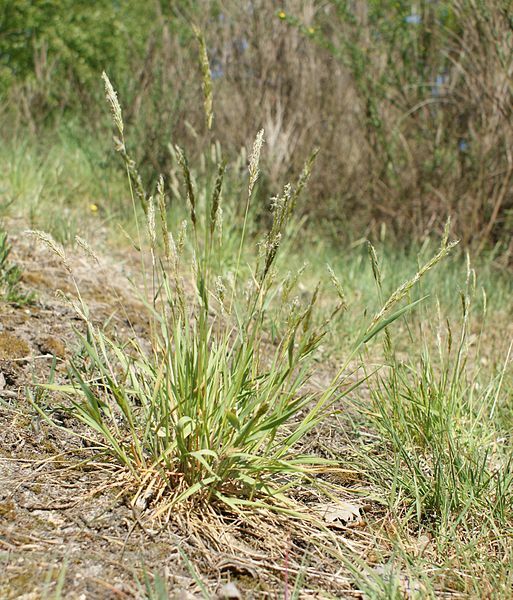 Contains chemicals that inhibit growth of other plants, but decomposing plants increase growth of other grasses (Pitcher 1995) probably by release of nutrients. Often infected by the endophytic fungus Epichloë typhina (Clavicipitaceae, Ascomycetes). The fungus may help protect the plant from herbivores but may also render it sterile by replacing seeds with fungus (Clay and Leuchtmann 1989; Schardl and Leuchtmann 1999).